2000 Food Distribution Magazine "1st Place, Mild"
2001 Food Distribution Magazine "1st Place, Insane"
2003 Houston Hot Sauce Festival "People's Choice- Hottest Sauce at the Show"
2004 Houston Hot Sauce Festival "People's Choice- Hottest Sauce at the Show"
2005 Houston Hot Sauce Festival "People's Choice- Hottest Sauce at the Show"
2006 Houston Hot Sauce Festival "People's Choice- Hottest Sauce at the Show"
2000 Food Distribution Magazine "3rd Place, Hot"
2003 Houston Hot Sauce Festival "People's Choice- 2nd Place, Hot"
2000 Food Distribution Magazine "3rd Place, Yow!" 2001 Food Distribution Magazine "2nd Place, Yow!" 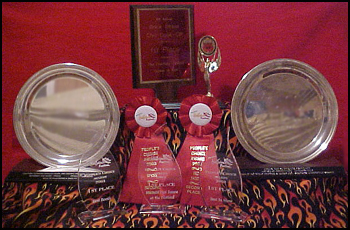 2007 Fiery Foods Challenge "3rd Place BBQ Sauce- Chile Specific"
2003 Houston Hot Sauce Festival "People's Choice- 2nd Place, Spices"
2005 Australian Hot Sauce & Fiery Foods Festival "Hottest Sauce"
2011 Houston Hot Sauce Festival "People's Choice- Hottest Sauce at the Show"
2005 Australian Hot Sauce & Fiery Foods Festival "Best Habanero"
2004 Houston Hot Sauce Festival "People's Choice- Best Habanero"
2007 Fiery Foods Challenge "3rd Place Hot Sauce- Mild"
"People's Choice- Best in Show"